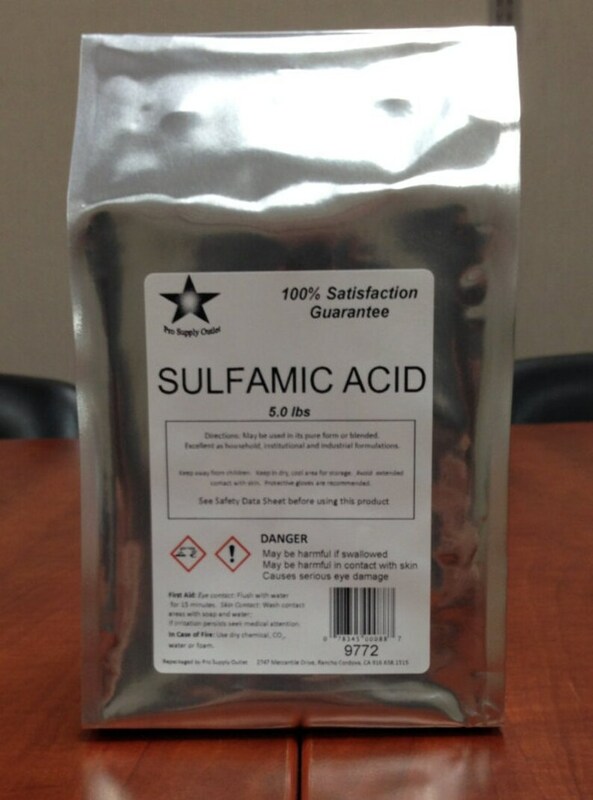 Sulfamic Acid 30 Lb Pack FREE SHIPPING!! Metal and ceramic cleaning, nitrite removal in azo dye operations, gas-liberating compositions, organic synthesis, analytical acidimetric standard. Our Chemical Products are shipped with current globally harmonized Safety Data Sheets and Labeling. Quantities smaller than original package are carefully repackaged and sealed in smaller Foil, Plastic, or HDPE containers. Packaging is designed to minimize shipping costs and give you the best possible value for your compounds, craft making, toiletries and soaps. Shipments are classified ORM-D when applicable. Our packaging meets all US DOT specifications and our shipments are all made with reliable licensed carriers to deliver your high quality product in a timely manner. U.S.P. / Food Grade: A chemical grade of sufficient purity to meet or exceed requirements of the United States Pharmacopeia (USP); acceptable for food, drug, or medicinal use; may be used for most laboratory purposes. A.C.S. : A chemical grade of highest purity and meets or exceeds purity standards set by American Chemical Society (ACS). Reagent: High purity generally equal to A.C.S. grade and suitable for use in many laboratory and analytical applications. Technical: Good quality chemical grade used for commercial and industrial purposes. Not pure enough to be offered for food, drug, or medicinal use. Lab: A chemical grade of relatively high quality with exact levels of impurities unknown; usually pure enough for educational applications. Not pure enough to be offered for food, drug, or medicinal use. Purified: Also called pure or practical grade, and indicates good quality chemicals meeting no official standard; can be used in most cases for educational applications. Not pure enough to be offered for food, drug, or medicinal use. PURCHASE REQUIREMENTS / Terms of sale. To purchase products you must meet the following criteria. Your order for products represents your confirmation that you meet the criteria and agree to the terms of sale. This item is a consumer commodity that I am using for hobby or other household use. As the user I understand that I am responsible for determining the suitability of this product for its intended use, and assume all risk and liability whatsoever in connection therewith. The manufacturer and seller make no representation or warranty, including merchantability expressed or implied. Seller and manufacturers’ liability from any losses or damages resulting from any cause whatsoever shall in no event exceed the purchase price of this product. Perfect products and well packaged, thank you ! Delivered on time and packaged well. I can't wait to try on my soaps and bath bombs!!!! 14 day limit for returns on unused items.